In his classic work Upadesa Saram (Spiritual Instructions) Bhagavan is questioning the idea of doership in the first verse itself. Bhagawan explains in the first verse why the individual performing the action is not the doer. If one understands the lie of doership, the spiritual journey is over because without that notion of doership there is no existence to the thesis of ego. Ego is altered consciousness in which consciousness is mixed with adjuncts like body, thought process (manas), intellect, memory. There is superimposition of work done by adjuncts on consciousness. Because consciousness identifies with adjuncts and feels that adjuncts are “him”/ “her”, the ego appears to arise as an independent entity. This feeling separates the individual from rest of existence and leads to misery. To overcome the resulting suffering that comes from separating from the rest of existence, ego devises various schemes to obtain pleasure and satisfaction at the individual level. But no permanent satisfaction can be achieved with this strategy. At present we are reacting with past memories to the challenges and conditions in life. All of our responses are conditioned by previous experiences and therefore we keep going in circles and repeating history of misery and suffering. As long as our actions are in unawareness, we remain imprisoned within our conditioning and are not able to see beyond it. Further, we identify with our action and hence further strengthen the ego and the notion of “I am the doer”. Our actions identified with the ego are inherently limited in granting permanent happiness and bliss. 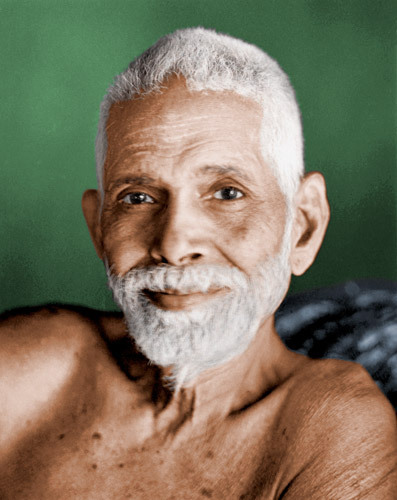 Bhagavan Ramana presents a fundamental shift in the paradigm of viewing reality. Bhagavan says, there is another power due to which we act and that actions are mechanical in a fundamental sense. Indeed, there is no need for us to be identifying with our thoughts and actions as everything is being done and accomplished by a higher power. When Sun shines the lotus blooms. Who is responsible for this blooming? It is a natural law that lotus blooms in Sun light. It is simply in the nature of things. If we meditate on the nature of things quietly, it will be found that there is no doer at all. Things are happening according to their nature and circumstances are unfolding. Mind always tries to translate the things that which it does understand into the language of the known by conceptualizing. In this first verse, Bhagavan explains the limitations of action and their mechanical role in our lives Action is insentient. They occur in the presence of the higher power we call God.